In a situation recalling the “It was the best of times, it was the worst of times” opening lines of Dickens’ A Tale of Two Cities, as it was announced last week that the Massachusetts unemployment rate had hit a new low of 2.8%, the Town of Franklin, MA was confronted with a housing shortage of potentially crisis proportions. The number of homes for sale in Franklin on MLS-PIN this January has dropped a foreboding 77% below the number of Franklin homes on the market back in January 2008. The relentless dwindling of available homes in town began in earnest in 2012 just as the Massachusetts economy started recovering from the Great Recession. As the MA economy strengthened in 2015 and 2016, the “new normal” in town became a standing inventory of between 35 and 80 homes for sale in any one month. The supply of homes often become low, but there always were affordable homes to choose from and the Franklin market functioned. 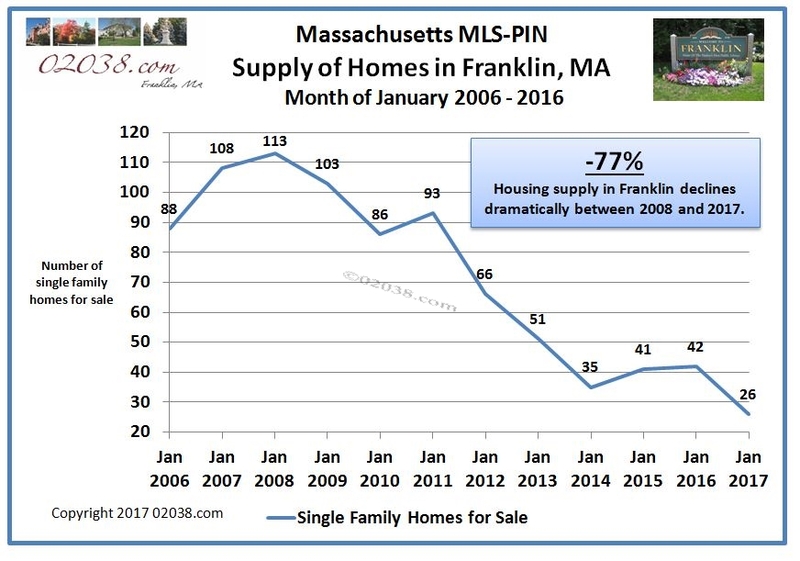 But then the unthinkable happened this January: the number of available Franklin homes listed on MLS-PIN dropped into the 20s! 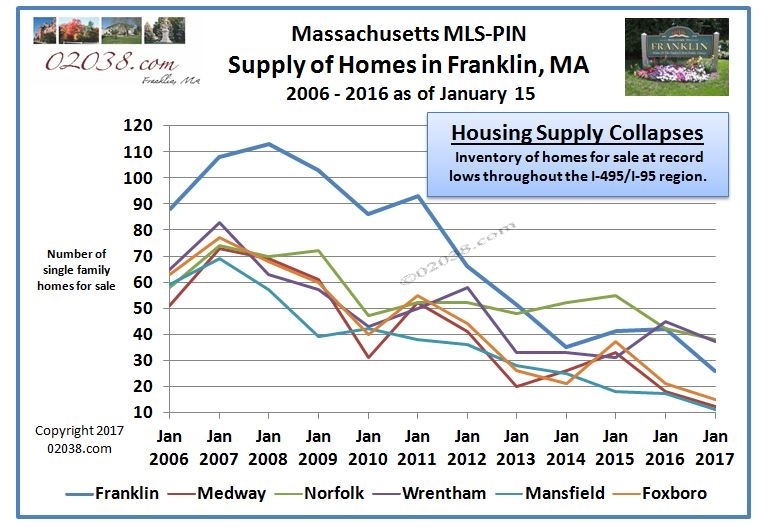 This crushingly low supply of housing presents a potential crisis for prospective home buyers and throws up quite a roadblock to the plans of trade up Franklin home sellers seeking to remain in town! 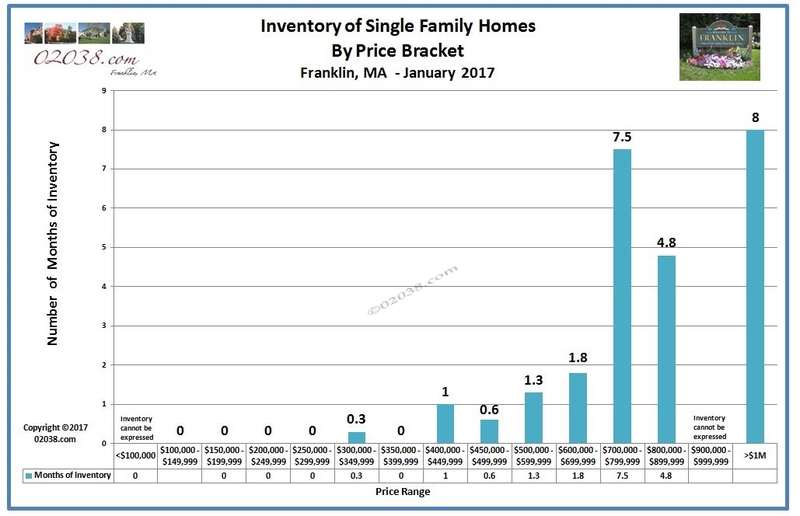 When the supply of homes for sale in Franklin, MA this January is expressed as months of supply and displayed by price bracket, the harsh reality of the market in Franklin becomes clear. In many of the more affordable price brackets, there is is literally nothing available in Franklin at all! There is no supply of single family homes for sale in the $200,000s, a minuscule 0.3 months of supply in $300,000 to $349,999 bracket and again, no supply of homes priced between $350,000 to $399,999 – nothing! Going higher in price, there’s scant supply this January spread among the $400,000 brackets and only 1.3 months of supply in the $500,000s. Even up in the $600,000s there’s only a paltry 1.8 months of supply for sale in Franklin this January. It’s not until you get up into the $700,000s that there is a decent supply of homes for sale in Franklin. Not that many people can afford to pay $700,000 and above for a home, especially not in Franklin, MA! It’s not that Franklin has sky high home prices and a history of a lack of affordable homes; offerings in the $300,000s have been very common in Franklin during recent years. In the last 3 years, the $300,000 – $349,999 and the $350,000 – $399,999 price brackets have been two of the most active price ranges Franklin. In 2016, 42 Franklin homes priced between $300,000 – $349,999 sold on MLS-PIN, while there were 51 Franklin homes sold on MLS-PIN in the $350,000 – $399,999 bracket. 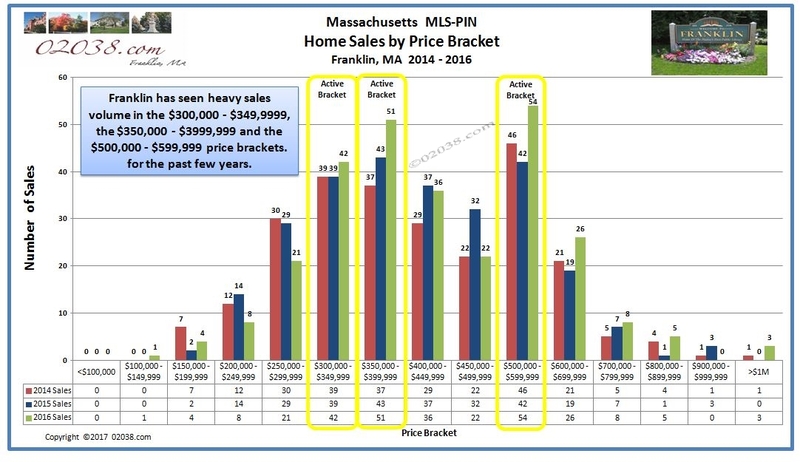 The $500,000 price bracket in Franklin Massachusetts has also seen heavy sales activity over the past few years. In Franklin, 54 homes changed hands on MLS-PIN during 2016 in the $500,000 – $599,999 bracket. To now have so little inventory currently available in the $300,000s and $500,000s in Franklin is setting the stage for a very challenging market this spring. 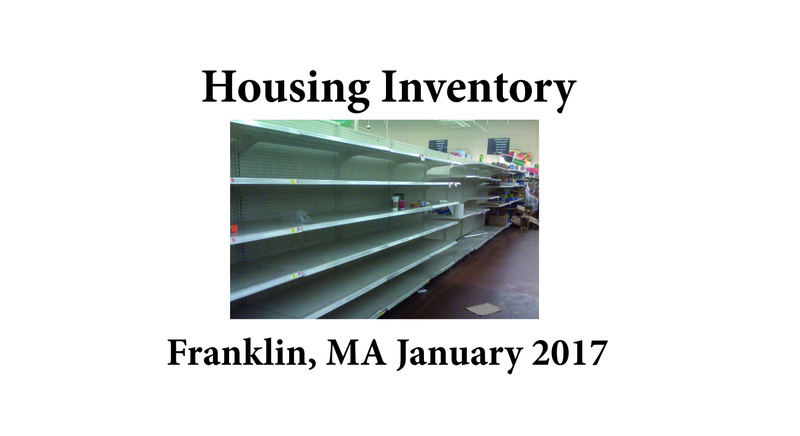 Don’t think you can jump one or two towns over from Franklin and find a cornucopia of housing riches in January 2017. The number of homes for sale in other popular towns in the 1-495 and I-95 region near Franklin is also greatly reduced. There’s simply not a lot to chose from in any area town with good schools! There will be new listings in Franklin and surrounding communities in coming weeks and months. The number of homes for sale in the various price brackets in Franklin certainly will fluctuate week in and week out. But the generally restricted supply of housing seems likely to remain with us as we enter the prime spring/summer home selling months of 2017. The Massachusetts economy is booming and there are very few new homes being built anywhere in Greater Boston. Whether you are planning on buying or selling real property in Massachusetts, you need a strategy on how to cope with the current ultra competitive, low inventory market. Everyone’s needs and personalities are different, so how you go about negotiating your way through the challenges and pitfalls of the Massachusetts real estate market may differ markedly from tactics suitable for someone else. 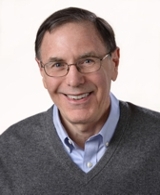 Consult with Warren for help devising your personalized plan of action. He’ll give you access to proven strategies that will help you achieve your real estate goals in today’s difficult market!